TTM #2 – Roberto Luongo! My second ttm attempt was with Roberto Luongo, one of my all time favorite goalies. It was successful! I really liked watching him when he was with the Canucks, the Canadian Olympic Team, and (for the second? time around) now with the Florida Panthers. He signed both a Canucks and a Panthers card for me, and the turnaround was very quick (like two or three weeks). So generous. Thanks man, I appreciate it! Author vbsportscardsPosted on November 25, 2018 November 25, 2018 Categories HockeyLeave a comment on TTM #2 – Roberto Luongo! 2017-18 UD SP Authentic Hockey — Great! I got a hobby box of 2017-18 SPA ($94.95 from dacardworld.com) and am quite pleased! The box has 18 packs with five cards each (four base and one insert per pack). The base card designs are a little boring but also very clean lol. This set is released late in the hockey season, so it’s nice that they include a highlight from earlier in the year on the back. I really like the autos I got, all on-card. Although each box has two autos on average (a Future Watch Auto and another one), I got three!!! First, a jaw dropper — Sign of the Times Rod Langway. Second, a Sign of the Times Logan Couture (c’mon, I know somebody gets to call him Juicy lol). Third, a Future Watch Auto from Christian Djoos of the Washington Capitals (always nice to get an RC of a guy who actually gets playing time with the big club). The other inserts are also pretty cool— three Authentic Moments (including Henrik Sedin’s 1000th point! ), four Rookie Year Milestones (including a Geno Malkin), three red parallels, one Spectrum FX (nice etched refractor), three veteran UD Updates and one Young Gun Update (Casey DeSmith of the Penguins). This box was a fun break. Personally, I think SPA is a great product with cool autos and some neat inserts at a reasonable price. I give 2017-18 Upper Deck SP Authentic Hockey a solid 4 out of 5 stars! 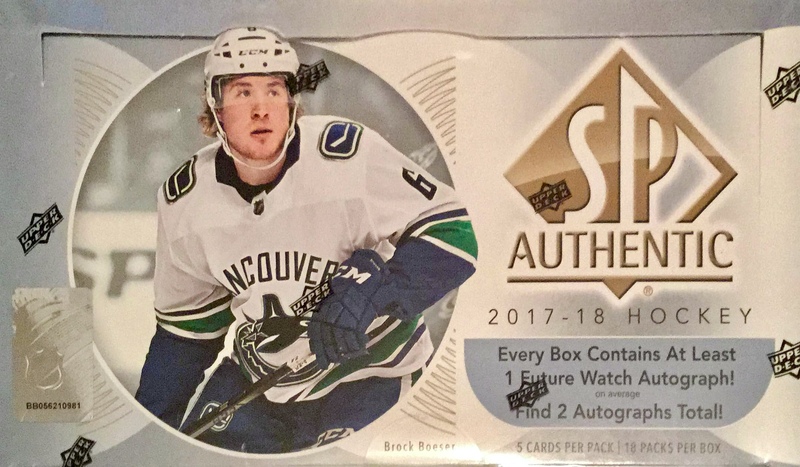 Author vbsportscardsPosted on June 2, 2018 June 2, 2018 Categories HockeyLeave a comment on 2017-18 UD SP Authentic Hockey — Great! 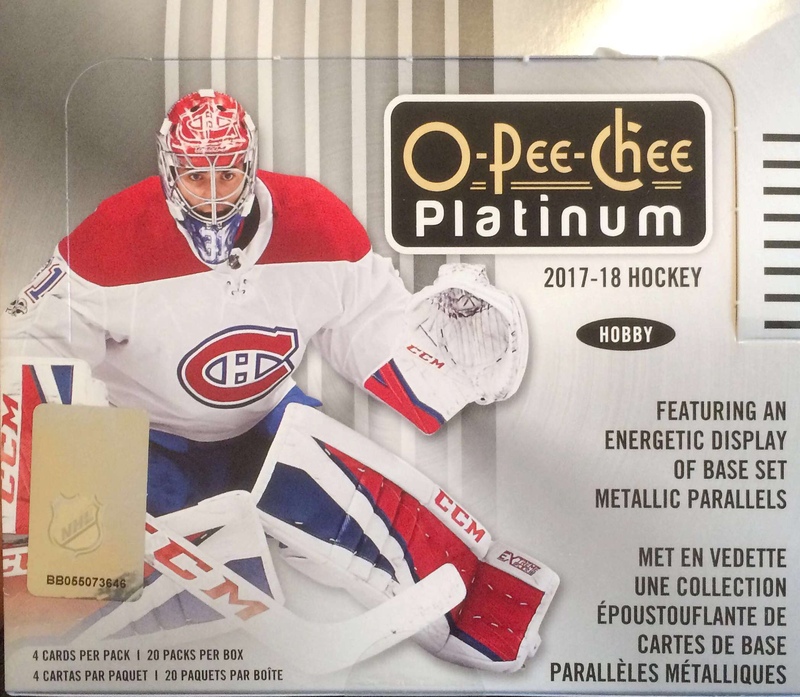 2017-18 OPC Platinum — Very Nice! When I think of OPC Platinum Hockey, I also think of Topps Chrome Baseball and Panini Prizm Football. All have the shiny chromium card stock and emphasize the rookies in the autos. Two of the three are subsets of the regular flagship set. Of the three for 2017-18, I like OPC Platinum the best. The shiny metallic finish naturally goes with the ice, metal skate blades, and speed of hockey better than with other sports. In addition to the rookies and stars, I am pleased that some of the legends are also included in the base set. While the inserts are not particularly captivating, and retro versions are just ok for me, the color parallels look fantastic! They include colors and designs such as rainbow refractors, violet pixels, red prism #/199, seismic gold #/50, orange checkers #/25, and I’m sure several others. I think the parallels are visually interesting without getting too distracting, and appreciate that the parallel colors are also used on the backs of the cards (making them easier to spot while flipping through an album, if nothing else). I like the hobby box I got ($89.95 plus tax at the LCS, DJ’s Sportscards, 20 packs, 4 cards per pack), and I didn’t even get a lot of my favorite players or teams, yet. 🙂 Pictures of the cards I pulled are below (please pardon the distortions in the photos). The best hits are probably the Clayton Keller rookie red prism #/199, and the Mikko Rantanen seismic gold #/50, and the Alex Tuch rookie orange checkers #/25. The Kessel refractor, Gretzky base, Fluery base, violet Stamkos, and Messier Platinum Records are also among my favorites. The auto is from Vladislav Kamanev, nice rainbow parallel, in a Preds uniform, before he got traded to the Avs, and got his arm broken in his first game with Colorado. That being said, Kamanev was a strong performer with Milwaukee of the AHL and, if he can recover physically, projects to be a significant future contributor for the Avalanche. Anyhow, I’m getting another box ($79.95 plus shipping from Dave & Adam’s), and will probably supplement via retail packs, eBay and trades for my favorites, without going for the whole set this time. Overall, I really like the look and feel of 2017-18 OPC Platinum Hockey, and give it 4 out of 5 stars! Author vbsportscardsPosted on April 7, 2018 October 13, 2018 Categories HockeyLeave a comment on 2017-18 OPC Platinum — Very Nice! Of course, then I wanted to get some cards for the players and teams I was interested in… which lead to an eBay shopping spree… which lead to these lots of nice auto, relic, and #’d cards for about the same price as the SPGU box. Rationally, my shopping on eBay was a much better deal, yielding more cards with players, teams, and formats that I was interested in (that I hand-picked, in fact). The allure of the box is that you MIGHT get that “big” hit. I’ve gotten that “big” hit enough times that I still buy boxes. Let’s see what happens next year. Will I take this rational approach, roll the dice with another box, get into breaks instead, or just do all of them??? I tried a box of the 2016-17 UD SP Game Used Hockey. Overall, I’d have to say, “Hmm. Interesting!” Not particularly excited about the players I got, but the cards are very nice. The overall designs are eye-catching while maintaining focus on the player or relic as appropriate, and it’s nice that the designs for the various types of cards complement each other. The box, $85.95 from dacardworld.com, has 1 pack with 6 cards, which averages to $14.33 a card. Not sure what each card is worth (yeah, I know, it’s worth what you or someone else would pay for it). Same types of cards with more of my favorite players and teams, and I’d being going bonkers! For now it’s just interesting lol. The quality of these cards is very nice. The Nino Niederreiter card is a knockout, very nice auto with a thick patch that looks like it’s from a number on a shoulder. The Voracek, Shaw, and Larkin relics are all single color but they look pretty cool, and again if I was fans of those guys I’d be more psyched instead of just content and satisfied. The two refractors are nice looking cards, and the Montreal rookie is the only one I hadn’t heard of before. Been pulling a fair number of Habs cards lately. Anyhow, I’ll keep the Niederreiter for my PC, learn more about Lehkonen (the Canadiens rookie), and be open to trading or selling the other four. Maybe I can trade for some other SPGU from my favorite teams and players. So in case it wasn’t clear, lol, not psyched about the players but pleased with the cards, they are quite nice! 2014-15 UD Masterpieces Hockey – Wow wow wee! I broke my first box of 2014-15 Upper Deck Masterpieces. Fantastic! In the first three packs I got Sergei Bobrovsky (one of my favorites), a Wayne Gretzky b/w portrait with leather texture, a Guy Carboneau auto, and a Jonathan Huberdeau auto, with both autos signed on card!!! Plus a bunch of other inserts and base cards. Most of the cards in the set feature a painted portrait on a leathery texture. Besides the autos and relics, parallels include red cloth frames # /100 and black leather frames # /50. The main inserts are the b/w portraits and “wire photos”. All the cards are very nice and have a classic quality reminiscent of “masterpieces” would find in a museum. This box saved the best pack for last. After I opened it, I was speechless. A Jean Believau black leather framed stick relic card # /35!!! Wow wow wee!!! Awesome. I got a second box from Dave and Adam’s Card World. It wasn’t as spectacular as the first, but still pretty cool. The Brendan Gallagher black leather framed tricolor GU patch relic is sick! The Billy Guerin auto and Kyle Turris GU are also nice cards. Got some sweet parallels too, like a Crosby portrait. The base cards in this box complimented the ones in the previous box, leaving me with around 10 doubles and 6 cards needed to complete the base commons set (#1-90). Gonna leave the other parts of the base set (SP’s, portraits, wire photos) incomplete, except I might do some trading and pick up some favorite players or cards to fill binder pages. All in all, I really like these UD Masterpieces cards! Author vbsportscardsPosted on December 26, 2016 December 21, 2016 Categories HockeyLeave a comment on 2014-15 UD Masterpieces Hockey – Wow wow wee!